Get the real theater experience with this 4K Ultra HD Blu-ray player. 4K Ultra HD resolution gives you the big-screen picture, while Dolby Atmos and DTS: X create the authentic theater atmosphere. 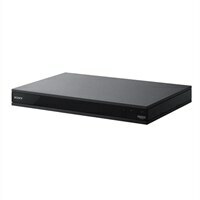 Sony UBP-X800 3D Blu-ray disc player upscaling Ethernet, Bluetooth, Wi-FiGet the real theater experience with this 4K Ultra HD Blu-ray player. 4K Ultra HD resolution gives you the big-screen picture, while Dolby Atmos and DTS: X create the authentic theater atmosphere. Support for the BT.2020 color spaces means access to a much wider range of colors. This ultra-wide color space means content creators can deliver much more saturated and realistic color from deep aquatic blues to natural greens and vibrant reds. Listen as lightning cracks, sirens wail, and car horns blare all around you in startling clarity with Dolby Atmos and DTS: X, the audio codecs, favored by cinemas everywhere. High-resolution audio tracks are far higher quality, letting you hear every breath, every drumbeat, every note. Upscale the frequency and dynamic range of MP3s and other compressed music - even your CDs - to near high-resolution quality, so you can get the full experience of the original recording. The UBP-X800's playing power goes far beyond the 4K Ultra HD Blu-ray discs. You can watch, listen to, and stream almost anything you like - including high-definition video and high-resolution audio formats, and a host of popular streaming services. Bring all your AV technology together and connect it to the UBP-X800. Ideal for home movies and music streaming services, it has high-quality connections to suit any technophile. Enjoy fast, stable streaming from a variety of services. The UBP-X800 offers up to 4K video streaming thanks to wireless with dual-band MIMO technology, for a strong signal - even on the edge of your wireless network's range. Amplify the effect of every cinematic moment, when you watch privately. The UBP-X800 supports Bluetooth audio transmission, so you can use your favorite Bluetooth headphones for private viewing without wires. Enjoy total clarity for dialog and soundtracks, near or far away. The UBP-X800 can send audio to your TV via HDMI, and to a wireless speaker over Bluetooth, at the same time.